"The glorious Amadeus Chandelier from Corbett Lighting literally needs no words, causing a visceral impact upon introduction. With graceful, hand-crafted arms, extending like icy tree branches, Amadeus is an execution in elegance, the classic European style chandelier reinterpreted for the 21st century. The delicate bronze finish provides a handsome contrast to the fixture's sumptuous Italian crystal drops that are peppered throughout and offset the faceted oversized centerpiece. 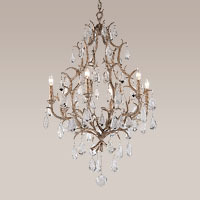 The multi-light chandelier could easily grace an entryway or dining room while delicate sconces are sound options for a foyer, corridor or hall." I can tell you, after seeing it in person, this is all true ~ it is exquisite!